This certainly isn't the best image of my mother, but I love this photo, taken outside my grandmother's house in the Winter of 1945/6, for the stories that it tells. My parents were married in January, 1946, so this must have been around the time of their wedding. Winter lasts from early November through March in Western New York, so it's hard to be more accurate. My father is wearing his Army Air Force hat and leather jacket, made for the brutally frigid temperatures that were found in the unheated Flying Fortresses where he flew as a waist gunner during the war. That jacket was a constant of my childhood; Dad wore it for years to do yard work. I can remember my mother mending the occasional worn spot, but it was a long time before it was finally retired. If you look closely at the car's windshield, you'll see the "A" sticker, a sign of war-time rationing when there were severe limits on consumption of gasoline. The Vintage Winter kit from Swirlydoos is full of papers from Bo Bunny's Winter Wishes collection, as well as the gorgeous Snowflake Frame 3 chipboard set from Creative Embellishments, rusty jingle bells from Darice, a jar of Aleen's Glitter Snow and so much more! I love the frosted elegance of this paper - Chill from the Winter Wishes collection - and thought it would make a good base for my layout. I used a bit of grey cardstock and then a piece of the Core'dinations Glitter Silk in Silver Mist (also included in the kit) to mat my photo, with some packaging cardboard between each layer to give it some dimension. The chipboard pieces were given a light brushing of gesso and then a heavy coating of the Glitter Snow. 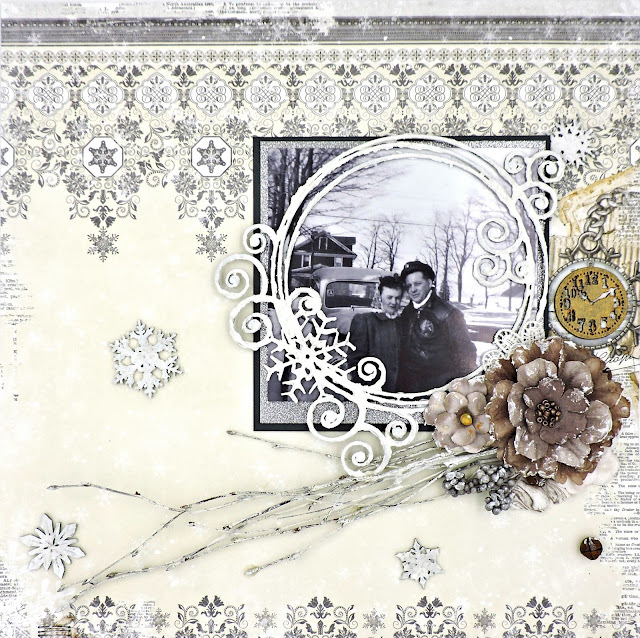 When dried, I applied the frame around my photo and scattered the snowflakes around the page. 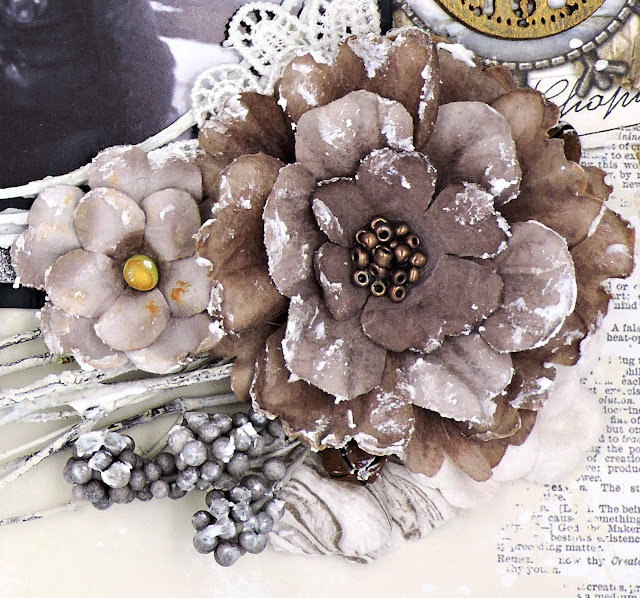 I've chosen some flowers from Prima Marketing's Salvage District collection and a bit of Magnolia Trim, also by Prima, and a few of the Darice Rusted Jingle Bells for the flower cluster. The snowy branches are a supermarket find from last November. The swirls in the inspiration photo clicked in my head at my first sight of the Snowflake Frame 3 and I just knew that I had to enter. The numbers gave me another idea: I dug into my clock embellishments and found this wood icon that I've treated with some Gilding Wax and placed beside my photo.